Having launched in March, Shake.io aims to connect students with paid graduate positions and internships. 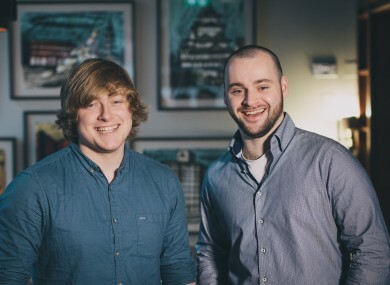 Thomas Cullen and Kevin Holler, the co-founders of Shake.io. FOR MANY THIRD-LEVEL students, finding a job or position once they graduate can be a daunting prospect, even more so when it’s a position in their chosen field. To get a job you need experience and when some companies advertise internships that are free or only offer expenses, it can make a difficult prospect even harder. It’s something that Shake.io is hoping to change. Having launched back in March, and been in development since May 2014, the service has seen 650 students sign up and 20 companies advertising positions on it so far. The important part: all positions are paid graduate positions and internships. A conscious decision made by the two co-founders Kevin Holler and Thomas Cullen. Both Holler and Cullen spent months developing the algorithm that powers the service. Instead of offering a standard jobs listing, it matches up students with jobs and vice versa by analysing their skills and experiences. Instead of presenting jobs that you might be interested in, it filters them down to a few specific jobs that suit you best. For the companies, it presents those who are best suited to the job while paying a monthly subscription fee to advertise said positions. For something like this to work, a lot of weight is placed on the algorithm to accurately assess candidates and deliver accurate results. More than eight months was spent developing it, and both it and the information provided by companies and students has the potential to be more valuable than a standard CV. There’s a lot of valuable information to work with if done right. When a company posts a job, the algorithm chooses the right candidates by looking at those who are interested, what skills they have – both essential and optional ones that can contribute to a position – and whether they have the projects and experiences to back their skills up. There’s already a lot to work with, but there’s significant potential to expand if it can prove its system works. This is really only the beginning of how complex this is going to be and how the algorithm is going to become as we add things… there’s this whole other breadth of experience and things people have done, we can add more using data into how we match people up and calculate how relevant they are. While the focus is mainly on students, there is a distinct possibility of it evolving into a standalone jobs site. Third-level students will eventually move on to bigger and better things and it would be a waste to have a system like this and it only being relevant for a few years of a person’s life. Holler says that moving into this area would “be the natural course that will happen further down the line” but for now, they’re focused on improving the algorithm so more people start using the service. The positions themselves are mainly tech-based since that was an area they were familiar with as well as deciding to focus on one specific industry and get that right. If they can show how well it works for one area, it would show its value and encourage companies from other industries to sign up as well. So far, the focus is on Ireland, but it’s looking at the US, starting with Boston first as there are close to 60 colleges and universities there, giving it a good place to prove its product works. There’s a specialised app on the way and come September, it will place a greater focus on graduate positions as students enter their final year. Until then, the aim is to improve the core product and increase the number of companies and students using the service, becoming more than just a jobs portal for students. Email “This startup is trying to solve the tricky business of finding graduates jobs”. Feedback on “This startup is trying to solve the tricky business of finding graduates jobs”.